Buses and boats blocked streets. I treated 2 victims on the top floor of the white hotel building. Then hopped from the second floor balcony onto the tilted, brown pickup truck to get to another victim in the brown hotel. Our vacation in Thailand took an ominous turn the day after Christmas. 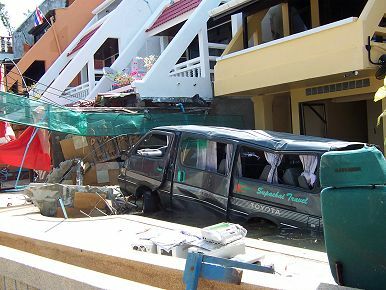 During the monumental Indian Ocean tsunamis on December 26, my wife, my son and I had just arrived at the south end of Patong Beach, on the island of Phuket, one of the severely impacted beach areas in Thailand. Our hotel was one building back from the beachfront hotels, so although there was brief flooding on the ground floor level and later problems with water and electricity, we were fine. My notes focus on the first three hours of first aid and rescue before the ambulances arrived---at one portion of one beach on one island. This kind of effort went on at thousands of locations around the Indian Ocean that morning against a backdrop of unknown risk of further tsunami waves. For these countries December 26, 2004 was like September 11, 2001 in the USA. As background: We were so far behind at work and at home, that even in early December we were not sure we could take the time for the trip. So on December 13 when we finally confirmed the hotel reservation, the waterfront hotels were booked for the Christmas holidays. The hotel we did get was spacious and had 36 acres of grounds with tropical plants (Duangjitt Resort on Patong Beach, http://www.duangjittresort-spa.com/). As our taxi drove from the Phuket Airport late on December 25, we passed through downtown Patong Beach and saw plenty of activity in the clubs and restaurants even at that hour. We checked into our hotel shortly after midnight, and noticed that there was still a party listening to the band in the open air bar. Those were the hotel guests who probably would sleep in and not go to the beach too early on December 26. At that point we did not have a clear understanding of where the beach was located in relation to the row of waterfront hotels. Those hotels were separated from the Duangjitt Hotel by a large lawn and garden, maybe 100 yards wide. We slept in late, but about 8AM we were awoken by the bed shaking for 2-3 minutes (and it was not from the couple next door). It was clear this was an earthquake, followed 20 minutes later by another. Because this is not a region of major quakes, I just assumed that they were small, local quakes. The possibility of a tsunami never crossed my mind. We lingered at breakfast in the open air restaurant adjacent to the hotel lobby. As we later realized, almost all of the guests were from Europe, with very few visitors from Canada and the USA. Many did not speak English well and the Thai hotel staff knew just enough English to do their jobs rather than converse. Communications was to become a major problem. William, Mardie and I were just heading upstairs to change for the beach when we suddenly noticed people running into the lobby from the hotel entry driveway, shouting in Thai. We did not know what the commotion was about. I heard an explosion and saw a roiling black mass of water next to a waterfront hotel. I thought it was a sewer line breaking. Mardie thought it was a dam failure, and many others thought it was a terrorist attack. Quickly after there were more distant explosions to the north up the beach, sounding like canon fire. The "explosions" were from the initial large wave slapping into the concrete buildings as the wave successively reached different points up the beach. Then I saw a swell of floodwater heading our way--- perhaps just a 3-4 foot deep plateau of water with a roiling mass of water and debris at the leading edge. Then I finally realized it was a tsunami, related to the earthquakes two hours earlier. However, even at that point I thought it was a small tsunami and did not understand the magnitude of the disaster because our view of the coast was blocked by the intervening palms and line of beachfront hotels. We went up to our second floor room and saw the floodwaters quickly fill up the courtyard around the pool, carrying chairs, palm fronds and other debris with it. A few minutes later a second, higher wave of floodwater entered the courtyard and filled the pool with mud and debris. The water eventually reached the lower edge of the sliding glass door to the room below us. It flooded out some bungalows, but only entered a few of the ground floor rooms in the main building. A sinkhole started to form underneath the patio below our room, and floodwater rushed under the building. Mardie had gone downstairs to check on the flood and quickly called me to say that there were injured people in the lobby. I went downstairs and found panicked tourists milling about. Several injured people were lying or sitting in the open air bar. A young Thai woman had a broken right arm and multiple abrasions and lacerations contaminated with sand. One of the hotel staff tried to translate and told us the woman was concerned that her money had disappeared from her bathing suit pocket. She did not know if she had been robbed or the wave action had cleaned out her pocket. I started to treat her wounds, but quickly realized that there were too many other wounded who also needed attention. Mardie and I recruited other hotel guests to help. We rigged up a splint from a broken piece of furniture, and I showed hotel guests how to cut up sheets and use bottled water to clean wounds. Lying on the floor was a young Thai man in a bathing suit who had inhaled a slurry of water and sand. Although he was frothing, his pulse and level of consciousness were good, and he could speak to me. An American I had not seen before stood on a chair and shouted over people in the lobby to tell them to keep calm, keep children nearby, not to run, and to check in for possible word of an evacuation. I thought he was the hotel manager, but we later learned that Michael Hoffman had just arrived from his home in Copenhagen and was checking in to the hotel when the tsunami hit. At this point, North Americans and Europeans watching television already had news of the huge earthquake and risk of tsunamis, but I did not understand the extent of damage even on our own beach. I mistakenly thought that the tsunami wave that hit our beach was not much higher than the torrent of water that reached our hotel. A German man and his son rushed up to us and asked if I could come upstairs to tend to his wife. Mardie continued to clean the Thai woman's wounds while I followed them up to the third floor, carefully stepping through the slippery mud around the poolside, where the floodwater had subsided. The German woman was lying on a mattress on the exterior walkway floor. She had a fracture or severe bruise of her left shoulder, but could still move her arm. She had several severe lacerations and had thick tar adhering to her skin. I showed her family how to cut up some sheets and dress the wounds. I lent them my penknife to cut the hair around a deep scalp laceration. I then went downstairs briefly to make sure there were no more severe injuries and checked in with Mardie who was still tending the Thai woman's lacerations. I tried to ask the Thai hotel staff if there were any more severely wounded people. Although I got a negative reply, I was not sure that they had understood me or even canvassed the hotel. I went back upstairs, checked on the German woman, and got my penknife back. As soon as I returned downstairs to the lobby, a Norwegian named Rolf, came up to me and said that there was a woman in shock in the adjacent waterfront hotel. Since the situation seemed in control in the Duangjitt Hotel lobby, I followed him through 1-2 foot floodwaters in a circuitous route across the open lawn to the backside of the Patian hotel [spelling?]. I was wearing flip flop sandals, so the footing was tricky as we slogged through mud and water, around rebar, lawn chairs, and other debris and jumped a drainage canal. Several times the mud sucked my sandals off, but I focused on moving as fast as I could without tripping and injuring myself on the hidden debris under the muddy water. As we walked to the beach hotels, a tall European man and a Thai woman were having an argument as they rushed away from the beach. I could only hear the Thai woman say, "You are not the only one who...."
Rolf and I reached the back of the beachfront hotels and went up the northernmost stairway which was slippery with mud, blood and debris. On the top (4th) floor there were two young English sisters who were wounded and a Thai woman and a Norwegian man (the latter had rented the room and the two English sisters had run without their shoes from the beach up the stairs as high as they could go to take refuge). One sister had relatively minor lacerations and was standing. The other was lying on the bed and was pale and shivering. Her pulse was surprisingly normal. She had multiple lacerations, the worst of which was a penetrating wound of her right gluteal muscle, deeply contaminated with sand and mud. Although the bleeding had stopped, I had no idea how soon she would get treated in the hospital since I had no idea how many injured there were elsewhere or when we could get her out. I had only heard one distant ambulance come to my hotel, and had no idea how close an ambulance could get to the waterfront buildings. So I showed the man and the Thai woman how to cut up some fresh sheets and clean up the milder lacerations while I tried to clean somewhat the gluteal laceration. As I was cleaning the lacerations, I looked out the window and for the first time realized that the surf was still high. In fact it occasionally surged into the lower floor of the hotel below me, rattling cars and other debris in the hotel courtyard. With so much debris, the waves made a powerful, rattling sound as they crashed, like the surf in the Bering Sea when ice is breaking up. At that point I assumed that the hotel was right on the beach and that the waves were only somewhat abnormally high. (In fact the hotel was separated from the beach by a patio, boulevard and seawall. The waves I was hearing were still tsunami waves that may have peaked 7-10 feet above the high tide mark). I realized that anyone who had not made it behind the hotels or climbed above the first floor of the beachfront hotels would most likely have been drowned, crushed or sliced to death. The only sound I heard was these incoming waves and a persistent horn from a small delivery truck that had been pushed onto a palm tree behind the hotel. The usually vocal local birds (Common Myna and Yellow-vented Bulbul) were silent. Farther out to sea the ocean was coated with debris and oil. Several boats and a passenger barge drifted around without a crew. A few boats were under power, presumably searching for survivors or bodies. The two English sisters' father was also injured but sitting on the balcony two floors below in the adjacent hotel (the SeaGull). I called down to him several times, but like his daughters he said he was injured but doing OK. I reassured the sisters and wrote down the name of my hotel on a calling card in case I could not get back. I then tried to get to their father from the second floor hotel room. The narrow gap between the two hotels was hopelessly filled with a tangle of debris. So the only way there was to climb onto the railing of the second floor balcony and then clamber down into the back of a Toyota pickup truck that was tilted at a 45 degree angle in the gap between the two hotels (see photo). I then climbed onto the pickup cab, which was slippery with mud and blood. I pulled myself onto the balcony of the SeaGull Hotel and met the English girls' father. He had multiple lacerations but one very deep one on the back side of his left thigh that extended across the back of his leg, with severely damaged muscle tissue and some persistent bleeding. Someone had used a sheet as a bandage but it was saturated with blood and hanging off to the side of the wound. Another tourist (Italian?) was standing nearby but I had trouble communicating with him. I tried to tell him we needed to find clean sheets to stop the bleeding. He got the idea and was about to kick in the nearby hotel room door, when I signaled to stop. The glass windows had been smashed by the waves, so I just reached around through the window and opened the door from inside. I put a clean pressure bandage on the Englishman and later helped him get out of the porch chair in the sun and lie down on the bed. He had plenty of water and a soda. He joked that he never liked Coke but really appreciated it now. I told him I would find a way to get him and his daughters out. I asked the Italian if there were more wounded, and he led me around a second floor walkway to the hotel office. On the floor was sitting a Thai man who had a single deep laceration on his ankle that he signaled had cut his Achilles' tendon. The dressing looked in good shape, so I did not change it. The hotel manager or desk clerk was there, but could barely speak English. He seemed dazed, but I was able to ask him if there were other injured people. He led me up a back stairway to the third floor where a heavyset German man was lying on a roll away bed. His wife was quietly sitting in a chair next to him. The German man spoke English and told me that he had been pinned by a car and had back and abdominal pain. He said he had just had abdominal surgery two weeks before. His pulse and color were good, but he may have had decreased sensation in his toes. He asked for an injection for his pain. I had to tell him that I was a tourist too, but we would find a way to get him out. A sudden moment of calm happened as I was about to rush downstairs. A woman in the adjacent hotel room (she sounded East African?) had been listening to my conversation with the German man. She appeared calm and focused (or maybe I just imagined that). She pointed out that the quiet German woman had a deep scalp laceration. So I asked the hotel manager if he could get a pair of scissors, and I showed the African woman how to cut the hair away from the wound and clean and bandage the laceration. I then asked the hotel manager how we could evacuate the injured. He led me down a back stairway to a loading dock. The loading dock backed up to what may have been a kitchen and dining room, but it was now completely blown open on the east and west sides, with tangled metal, vent pipes, and dangling wires bracketing a view of the ocean. At that moment we heard an ambulance siren and I felt a huge sense of relief. But as it approached a building just north of us, it turned back. 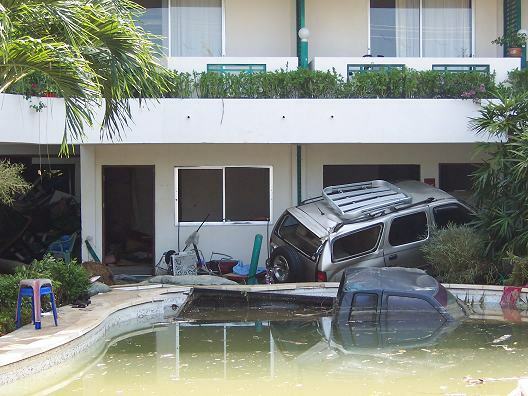 The front of the hotel was still not accessible due to water and debris. A dazed, middle-aged tourist walked into what had been the kitchen. He stated in a far away voice that the local authorities had predicted another, larger tsunami (10m) and that people were told to evacuate. He then slowly ambled toward the ocean. I called after him, but he just kept walking. A young man wearing a bike helmet ran in from the back and yelled out the same warning. The idea of a larger tsunami did not make sense to me. Although I had no idea where the earthquake's epicenter was, the fact that there were two major tsunami waves following two earthquakes, made me think that we had in fact experienced the major tsunamis from those quakes. If that were true, we would have to feel another quake of the same magnitude if there were going to be still more large waves. [That reasoning is not true, as rescue crews have discovered after Japanese tsunamis]. Nevertheless I was concerned that the injured may need to be moved soon if the warnings of new tsunamis were true. I wanted the hotel manager to send one of the uninjured men from his office over to my hotel, to get men to carry the wounded over there where I knew trucks were now able to drive to. But I either could not communicate this, or the man disagreed with my suggestion. So I wrote out two duplicate notes tersely listing the names, locations and condition of the injured people, with a priority list of who should be evacuated first in case an ambulance arrived before I could get back with stretcher crews. [Since we had only been in Thailand 10 days, I had no idea how emergency services are organized. It is quite possible that the hotel manager had sent out a messenger on foot with word of the injured, and he was just waiting for the ambulances to show up]. It was 12:30. I exited through what was left of the back of the hotel, and made my way to the main road that led inland. By this point most of the flood water had subsided. 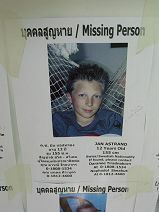 Back at my hotel, Mardie told me that the Thai woman with the broken arm had vanished. She had attended some other tourists with lacerations. One girl was panicked as she watched Mardie try to patch up a deep laceration that exposed bone on her father's leg. I approached Michael Hoffman and asked if he was the hotel manager. He said he was not, but asked what I needed. I told him I needed 16 volunteers and plastic pool beds to carry the injured from the SeaGull and Paitin hotels back to the Duangjitt Hotel where vehicles could transport them to the hospital. There were instantly plenty of volunteers. I told them that the first order of business was their own safety and that we would slog through the debris field only as fast as we could safely travel. Since I thought Rolf had been staying at one of the beachfront hotels, I asked him to lead us back to the English sisters' room. (It turns out Rolf knew no more than I did. He had been staying at the Duangjitt Hotel and did not realize that the beach access road was now a drier route to the beachfront. But at least he remembered the stairway to the room after our band of volunteers sloshed through the mud across what had been a lawn). When we got to the Paitin hotel, we initially climbed up the wrong stairway, then the correct one. There was a moment of confusion when I tried to split up the party of rescuers. I think a number of them did not understand my English, so a traffic jam occurred on the stairs. The stairway was too narrow for the stretchers, but the two English sisters were able to limp down with assistance. I asked Rolf and another European who had done some medic work to coordinate taking the two sisters back to the Duangjitt on the beach chairs. The rest of the rescue party then followed me across the second floor balcony and over the pickup truck and debris to the south balcony of the Sea Gull hotel where the Englishman seemed in good spirits. By this time the beach road in front of the hotel looked drier, but the stairway down was blocked by debris. I was not sure if exiting out the front was safe if in fact a major tsunami was going to hit as predicted. So five of us continued down to the office to scout out the back exit route. But the back route had some broken wall fragments surrounded by water, that made it difficult for a stretcher party to navigate. Then I noticed that 2 small ambulances had arrived immediately in front of the building. I gingerly negotiated the wreckage through the front patio and found that the German man was in one ambulance. A British woman doctor was tending to him in the ambulance. I led the other ambulance driver to the Englishman. Unbeknownst to me, some Thai volunteers started clearing away debris to the front stairway. So while I was trying to communicate a complicated exit route out the back, there was suddenly a perfectly clear, shorter route out front. One of the volunteers from our hotel vigorously tapped me on the shoulder and communicated this fact to me in Italian and English. Although that was the easiest exit route, I am still not sure that it was the safest since there could still be another major tsunami wave. The Thai medic brought up a stretcher board, and the Thai volunteers prepared to lift him. I quickly pushed a few of them to the side of the room since half of them were barefoot and were not aware of the broken glass on the floor. I pushed the glass out of the way, and the party then lifted the Englishman out to the ambulance. That seemed to complete the evacuation at that location. I took the unused pool chair back to the Duangjitt Hotel to check on the English sisters. But they had already been taken to the hospital by the time I arrived. I had expected to rest, but Mardie had been tending several other people with severe lacerations at the Duangjitt Hotel. They were about to be put on a truck to the hospital. Somehow word had been communicated to our hotel that another, 10 meter tsunami was coming and that we should all evacuate to higher ground. A truck had already taken small children and their mothers. Mardie, William and I rushed to our hotel room and gathered food, water, sunscreen, mosquito repellant, a Thai phrase book, extra clothing, and other essentials in daypacks and walked briskly up the road toward the closest hill. It was never clear how authoritative this evacuation order was. In fact, foot and auto traffic was moving both toward and away from the beach. We walked up the main road and then climbed up to some hillside apartments where several dozen tourists and Thais had already gathered. A very generous Thai woman who lived in one apartment passed around some food. Many of the Europeans had cellphones that allowed them to get text messages from Europe about the large quake. 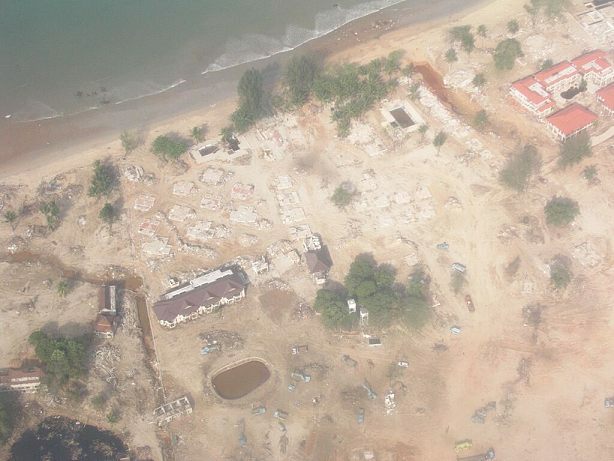 Four hours after the tsunami, we were finally learning the extent of the catastrophe. We spent the rest of the afternoon until dusk there, talking to the other refugees. The first prediction of a 3 PM tsunami passed, then the second prediction of a 5 PM tsunami also did not pan out. I read for a while. 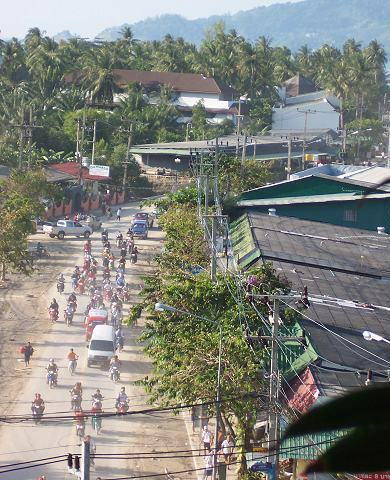 Several times there was a commotion on the road down below as trucks, cars and motorbikes would flee away from the beach, taking up both lanes of the road. The trigger for the panic was never clear. At 3 PM a policeman appeared on the road about half way to the beach. I watched through binoculars as he diverted traffic away from the beach, but allowed pedestrians to pass in either direction. We thought this was a further sign of an impending new tsunami, but we never knew the reason. After 15 minutes the policeman disappeared, and traffic resumed as before. As dusk approached, the three of us decided to have a quick dinner at a hillside hotel restaurant. Although the hillside apartments had electricity, the hotel did not, so we ate quickly by candlelight. We then walked back to the hotel by the light of the car traffic. Our hotel had partial power, presumably from generators, so there was light, but no air conditioning. The hotel staff and their Thai friends who volunteered to help had pulled together 2 large pots of rice and Thai curry that they offered for free to guests in the lobby. We sat around and talked with other guests to try to fill in the picture of the tsunami. We learned that at our sector of the beach, enough people sounded the alarm when the ocean receded that everyone ran from the tsunami. That was not true on other sectors of the beach where some people lingered or even approached the exposed sea floor out of curiosity. We heard many stories of suffering. One couple at the hotel had been walking on the beach. The wife made it back, but the husband was swept out to sea. 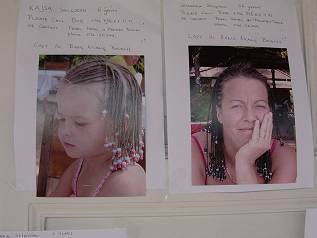 A twelve-year old girl had rows of parallel scrapes. She had been submerged and a car scraped over her. The stories went on. There were handwritten signs at the reception desk from people searching for missing loved ones. 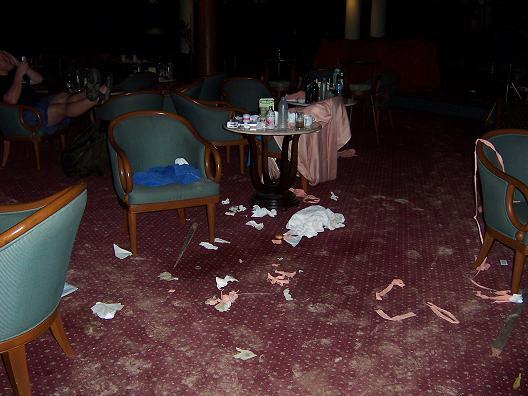 We later learned from Rolf that after we went to bed, the hotel staff told Rolf about 1AM that there was another tsunami coming and that the hotel would have to be evacuated. He was finally reunited with his wife who had spent the day in the hospital with two damaged vertebrae, but they and the other guests who heard the 1 a.m. tsunami warning, had to spend the night on the hillside. We never heard a knock at our room. At about 3 AM I awoke with a horrible cramp in my right calf. It lasted for over two hours. I attribute it to allowing myself to get dehydrated during the scramble to look for victims, and the fact that the bottom half of my right flip flop sandal had been sucked off in the mud. Throughout the next two days a very odd thing happened. Unlike the usual isolation among hotel guests, most people wanted to talk to each other, and perfect strangers were particularly eager to talk to Mardie and me since we had mobilized first aid efforts. The men who volunteered to carry the makeshift stretchers gave each other a knowing nod as they passed in the hall. Air conditioning and water were restored to our room mid-day Monday. After breakfast we walked to the beach for the first time and surveyed the wreckage of the beachfront hotels. 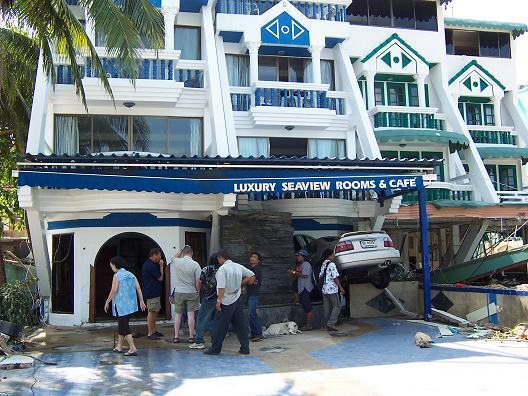 At the Sea Gull hotel, multiple cars were piled up against the seaward walls, and one car had slammed into the building perpendicularly so that it came to rest inside the guest room. It was obvious that anyone who could not find a stairway to an upper floor would not have survived the series of debris-laden waves. Work crews were cleaning some wreckage and pumping water out of several buildings, presumably looking for bodies. We put our feet in the Andaman Sea and then headed back to our hotel to rest for the day. Mardie picked up a small, oil stained plastic dove. The water was calm and inviting, but no one was swimming in the sea that had erupted so violently a few hours before. Back at our hotel, the main pool was filled with debris, but a smaller, slightly elevated pool was a place of surreal refuge for many of the guests. On Tuesday, December 28 we took an early taxi to the airport thinking that the road though the center of Patong Beach would be congested or blocked and that the airport would be crowded. In fact the inland route through town had only a little flood debris, and the airport was not particularly crowded. The Thai Airlines ticket agent said that 20 agents had been brought in from Bangkok on Monday, and 10 additional flights had been added for the mass exodus. There was an Italian Air Force C-141 and a Thai cargo plane on the tarmac. But other than that, the only evidence of anything unusual was the occasional tourist with bruises or multiple lacerations on the legs. One of the video clips that BBC World News and other media have been showing is a view looking down from a very tall building. The clip shows a tall tsunami wave hitting several 3-4 story hotels and then a surge of debris and water enveloping the lower floors and moving inland down a street to the left of the screen. That video was taken on our beach about half a mile north of our hotel. Thai TV and BBC had been showing that newsclip hourly, but I had no idea how much play the whole disaster received in the US media until we got back to Bangkok. 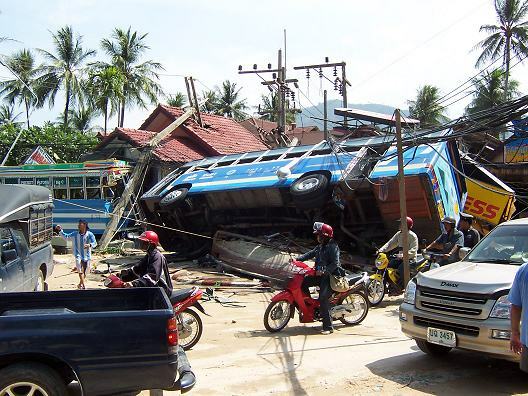 The big error everyone made in Phuket on December 26 was assuming that the earthquakes before the tsunamis were small and local. Best guess is that in southern Thailand we felt the main shock (magnitude 9) and a large aftershock (magnitude 7.1 off the Nicobar islands). The best course of action when your are at the coast and you feel an earthquake, is to evacuate to high ground or climb to a higher level in a concrete building immediately (unless you have solid news of no danger). Tsunami waves might arrive in seconds. Everyone needs to spend half an hour at home organizing a household emergency plan. This is especially relevant for those of us in Pacific rim countries who live in earthquake and tsunami country. An example of what to consider is at: http://www.doh.wa.gov/phepr/handbook/family.htm. It is not clear that the first aid I administered actually saved anyone's life. 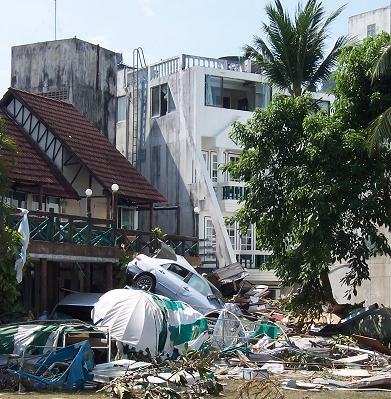 It eventually struck me that anyone who suffered a severe bleed or other trauma from the first tsunami wave was very unlikely to be able to climb to the second floor of the beachfront buildings before the second, larger wave arrived. Getting people out of the waterfront buildings as we did, would definitely have saved their lives if a later set of larger waves came in (especially if the incoming tide were higher during this full moon). On the other hand, if much larger waves struck while the volunteers from my hotel were hauling the improvised stretchers, we might have suffered further casualties. This has happened in Japan when firemen have arrived at a tsunami disaster too soon after the initial waves. By daylight on Monday, December 27, I realized that we had been lucky in many more ways than I appreciated on Sunday. Obviously, our late arrival and sleeping in late were the important factor that kept us off the beach when the waves hit. We had considered taking an early dive boat on Sunday, but those boats would have arrived in shallow reefs precisely when the tsunami hit. Not being in a beachfront hotel was clearly a big plus for us, as was the wide, undeveloped lawn and garden that buffered our hotel from the beachfront. But even more important was the fact that the concrete hotels immediately in front of us were 2-4 stories tall and built side by side. So they effectively created a concrete sea wall that absorbed almost all of the initial violent impact on our part of the beach. The narrow gap between the Sea Gull and the Paitin hotels might have allowed the full force of the waves to strike our building, but that gap was instantly plugged by cars and debris (see photo above). 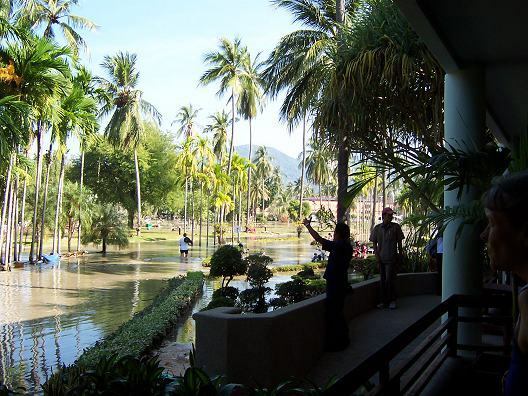 Thus, the tsunami waves could only reach our hotel by narrow jets of water penetrating through the ground floor of the beachfront hotels and the huge surge of water swirling around the north end of the hotel strip, along the main road inland, and then over the large lawn. This slowed down the water considerably. 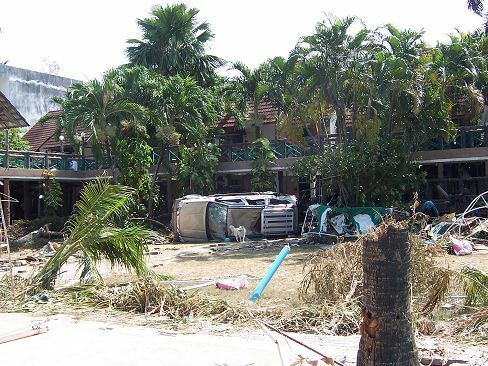 Looking at the news photos of Phi Phi Island, I wonder if the less substantial beachfront buildings there could have been a factor in the more extensive damage inland (initial reports from geologists suggest that the the tsunami waves were 5 meters high where we were at Patong Beach, and 5-6 meters high at Phi Phi). Also the tourist village at Phi Phi island is on a low beach saddle, whereas the beach at Patong is below a small seawall that probably absorbed some of the waves' energy. The tsunami waves were quite variable over the region, presumably due to differences in local seabed topography. On Phuket Island, Patong and Kamala beaches were badly affected, but many other beaches were untouched. Khao Lak, to the north of Phuket island had waves 10-11 meters high (see aerial photo above). According to the New York Times on January 5, 90% of the hotel rooms at Patong Beach were back in service, but not surprisingly, hotel occupancy was only 38%. 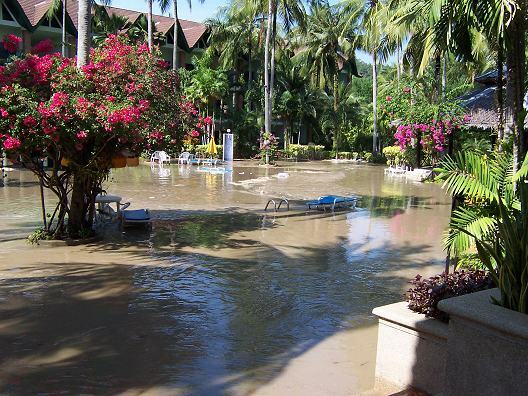 At Khao Lak it may take a year for hotels to reopen. The press reported extensive, long-term damage to reef and mangrove ecosystems (e.g., Wall Street Journal, Jan. 17, 2005). But surveys by scientists and dive shop operators found that reef damage was quite variable, and many deeper reefs were not that heavily impacted (Science 2005, 307:657; http://www.scubacat.com/divesiteupdate.html). Salt water intrusion into lakes, streams, and ground water will have a long term impact on water supplies and ecosystems in many areas. One advantage we had in this disaster was that unlike in the USA, the hotel rooms had lots of bottled water. So even though the piped water was not working, there was plenty of bottled water for cleaning wounds and hydrating survivors. 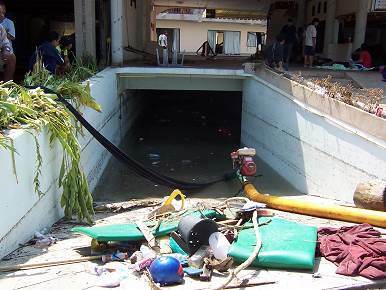 Communications and information flow is often a problem cited after disasters. The language barrier in Phuket created a number of problems during the day. My family almost brought a cellphone with international roaming capability as well as two FRS radios, but decided not to at the last minute. We had talked about calling Hal Mofjeld at NOAA/Seattle to get an expert opinion on the tsunami risk before we walked back down from the hillside to our hotel Dec. 26. I was so focused on finding the next severely injured person and maintaining safe footing when I traveled around the beachfront hotels that I forgot a basic point of mountaineering: always look back at every trail intersection so you know how to get back if you have to. That failure created delays in getting back to the SeaGull hotel that could have proven costly if another tsunami had hit during the rescue. 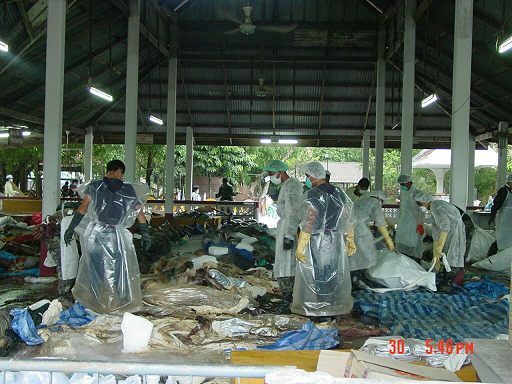 The medical system was swamped, given that over 1000 people were severely wounded in Phuket province the first day (in addition to over 260 dead and 700 missing). But hospitals were even worse off in the province to the north where there were far more casualties. I later received an email from some of the survivors I had helped (the English family I first saw at the beachfront hotels). They said that their wounds were promptly attended to when they reached the Phuket emergency room, although they required multiple surgeries and were still recuperating 4 weeks later. I asked them how they wound up where I found them. The response: "We were not staying in either hotel but had been on the beach then walked across the road only to be pushed through a shop window. The shop was standing in front of the hotel but was demolished by the wave! Hence the hotels were just a convenient shelter. We were all lifted/clambered up on to "my" balcony first, then the girls moved to the higher ground where you found them after rumours of a larger wave coming. As you'll remember I wasn't in a fit state for more climbing." The Thai ambulance crews were reassuring once they were able to reach the waterfront hotels near us (about 3 hours after the tsunami). I don't know how they prioritized evacuating the wounded from various sectors of Patong. Telephone service had been cut off, and nobody at our hotel seemed to have a radio or other means of contacting the 2 hospitals. The only question I had about how the ambulances operated was whether it would have been better to evacuate the injured from the back of the hotels instead of the front beach side, in case another big wave hit. 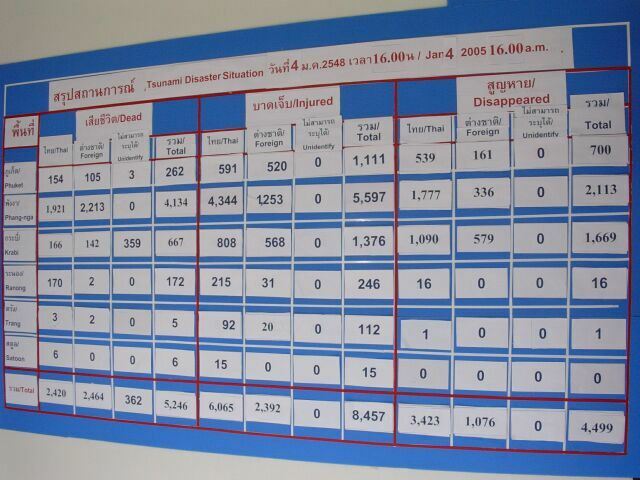 The Thais brought in relief teams of surgeons and other personnel by Monday. The Thai news did discuss the need for psychological counseling among survivors, but the media also said that the country had very little capacity in mental health services. Several of the European tourists were urging us to use whiskey or vodka to clean wounds. I told them that was not a good idea. Here is what a University of Washington colleague who is a trauma surgeon and epidemiologist told me, "If some sort of definitive care is to be done within the next few hours, the only real first aid priority is to stop bleeding, primarily through direct pressure (manual or with gauze or bandages or any sort of cloth) or compression of pressure points (e.g., femoral artery in groin for bleeding more distally in the leg, etc). If definitive care will not be for a long time (e.g., day or more) and the wound is grossly contaminated (e.g., dirt or other material with high bacterial contamination), and bleeding has already been controlled, then brief mechanical debridement (e.g., as by irrigation with clean water) would be indicated. There is no benefit from antiseptic (especially one like alcohol) at this stage. Soap and water, possibly OK...but the main need is to remove debris, not sterilization. Something painful, like alcohol, would probably not cause much damage, but would cause unnecessary pain, with no real benefit." The Easter Sunday earthquake 4 decades ago in southern Alaska was about as big as this one but caused far less damage because the area had few people. The largest earthquake ever measured (9.5 off Chile in 1960) generated a tsunami, but only a few thousand people died because the earthquake and tsunamis affected sparsely populated areas (http://pubs.usgs.gov/circ/c1187/). The risk of damage and lives lost in the Indian and Pacific Ocean Basins is going to get far worse as human population growth continues and as individuals choose to live near the coast. The population of Thailand is estimated to increase by only 15% in the next 45 years, but the population of India could increase by 50% and in Somalia by 207% at current rates (www.prb.org). Without warning systems, public education, and a balanced approach to development in coastal areas, the risk of damage will most likely be higher from future tsunamis and earthquakes in the region. Destruction of mangroves and coral reefs in coastal areas further increases the risk by reducing natural buffer zones (http://worldwatch.org/pubs/paper/158/). The United States has a history in the last 20 years of very limited contributions of foreign aid---in fact one of the lowest rates of contribution among major developed countries, i.e., less than $50 per person per year, less than 0.1% of our Gross National Product and seven times lower than many European countries. In fact, much of our foreign "aid" is military aid or economic assistance funding which simply offsets debt rather than provide direct assistance to help poor people get on their feet. There are plenty of unmet needs and missed opportunities. For example, 1 million children die each year from measles worldwide, and there are 140 million unplanned pregnancies per year. Yet the USA dramatically reduced our commitments to some of the most effective foreign aid programs: UNFPA (the United Nations Population Fund, http://www.unfpa.org/, and the International Planned Parenthood Federation, http://www.ippf.org/). After fomenting wars in Central America two decades ago, we backed off of reconstruction aid. The big publicity around new international AIDS resources has not been followed up with all the funding promised. Reconstruction aid to Honduras after Hurricane Mitch has been limited. The list goes on. So making lofty commitments during the major publicity phase of tsunami recovery is great, but we need to be sure that the federal government follows through with those pledges. We also need to be sure that the current U.S. administration does not simply rob existing, poorly funded foreign aid accounts to finance the acute relief effort. Now is the time for a larger national dialogue on foreign aid and our relationship with less developed countries. 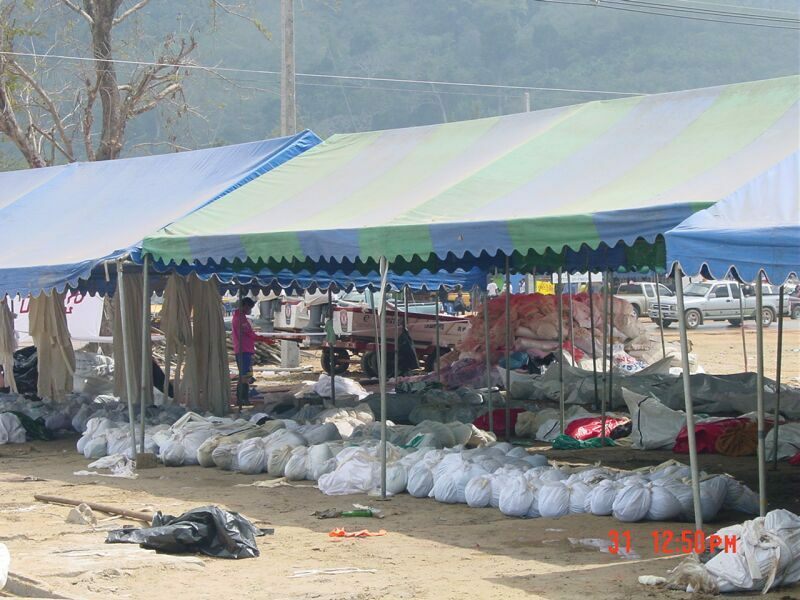 A final note: the Thai people we met before, during and after the tsunami were wonderful. Although there were later reports of looting, what we witnessed were hundreds of people streaming to the shoreline areas to volunteer to help. We want to go back. Abramovitz, J. N. 2001. Unnatural disasters. Worldwatch Paper 158. Worldwatch Inst., Washington, DC. Noji, E. K. (ed). 1997. The public health consequences of disasters. Oxford University Press, New York.